I’ve just posted today’s Cookbook Review: My Greek Table by Diane Kochilas. I mentioned several recipes and put the photo in for this one: Grilled or Seared Leaks with Shaved Sheep’s Milk Cheese and Prunes. It’s very Greek, very close to the earth, and a recipe you are rather unlikely to have even heard of before, let alone had the pleasure of eating. Spring is soon. Leeks are soon. PLAN! And await pleasure. You say you don’t like prunes? Have you ever eaten one? With cheese? Cut the leeks in half lengthwise and rinse thoroughly under cold water to wash away any grit. Bring 1 inch (2.5 cm) of water to a boil in the bottom of a pot fitted with a steamer basket. Place the leeks in the steamer basket, cover, and steam for 10 minutes. Transfer to a bowl, toss with 3 tablespoons of the olive oil, and season to taste with salt and pepper. Whisk together the remaining 3 tablespoons olive oil, the vinegar, lemon juice, prunes, and lemon zest in a small bowl and season to taste with salt and pepper. Heat a grill to medium or heat a grill pan over medium heat. Brush the grill grates or pan lightly with a little olive oil. Grill or sear the steamed leeks, turning them often with tongs, for 5 to 8 minutes, just until grill marks appear. Remove from the heat and place on a serving platter. 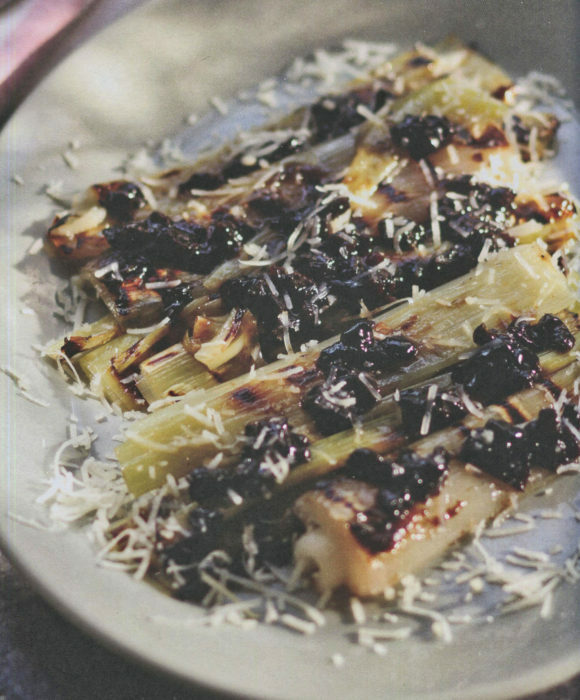 Drizzle the leeks with the prune dressing and garnish with the shaved cheese. Serve.